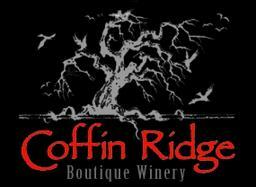 Coffin Ridge produces high quality, small batch wine and cider made primarily from fruit grown from hand planted, hand picked Grey County vineyards and orchards. Wine Club consists of twice yearly shipments (Spring and Fall) of 6 bottles containing exclusive wines from our cellar not available to the general public. Members are offered a special pre-release tour and barrel sampling conducted by owner Neil Lamont in the Spring as well as early access to new releases. May - November we offer a Vintner's Plate consisting of artisan cheeses, freshly baked bread, charcuterie, premium chocolates, homemade spreads, local seasonal fruits/veggies etc. for $22+tax. During winter months we offer a modified version, the Vintner's Picnic with crostinis and bread sticks in place of fresh bread, $22+tax. Products are available at the winery, online at http://www.coffinridge.ca/order and in LCBOs. Complimentary tours offered Saturdays @ 11 AM or by appointment for $3/person.